Can Micro-UAVs Help In The Fight Against Terrorism? Micro-UAVs can help track terrorists, but are they reliable enough to replace traditional intelligence methods? According to Lt. Col. Jim Storr, a core wish of the British Army since the time of the Duke of Wellington, has been the ability to “see the other side of the hill.” Storr, a retired British Army infantry officer, developed tactical unmanned aerial vehicle (UAV) reconnaissance systems for the Army in the 1990s. He provides a more recent context by stating how in Northern Ireland, British forces in South Armagh would have to cover a 160m2 area using observation posts (that had blind spots) and manned helicopters. Today, instead of helicopters Storr’s troops might consider a micro or nan unmanned aerial vehicle (UAV). Weighing in at between 2 kg and 20kg, the emerging micro/nano-class typically weigh less than 25 grams and forms the basis for many new applications and operation, particularly in the areas of counter-insurgency and anti-terrorism operations. Norwegian company Prox Dynamics’ Black Hornet UAV, which was used by the British Army in Afghanistan and is being trialled by the US Marines, has a rotor span of 120 mm, a mass of 18 grams (including cameras), a maximum speed of 5 m/s with an endurance of up to 25 minutes, with features including autopilot, GPS navigation, steerable electro-optical cameras and the ability to provide a live video feed and snapshot images. Considering the advantages of the Black Hornet, there are clear applications for nano-UAVs in a counter-insurgency or counter-terrorism role as troops on the ground would be able to use them when required without requiring permission from higher up the chain of command. Comparing legacy capabilities, Storr refers to the Westland Gazelle helicopter, of which, only two were available at any one time and whose use (by a company level formation) had to be authorised by a battalion commander. As nano-UAVs mature, they can further enhance counter-terrorism operations by carrying sensors to eavesdrop on conversations, observe the electro-magnetic spectrum and even sniff for potentially dangerous chemicals, according to David Dunn, Professor of International Politics at the University of Birmingham. Dunn also stresses another benefit—their small size and lack of noise provides persistent surveillance coverage of suspects with facial recognition greatly reducing risks to personnel. Although in theatres of operation such as Northern Ireland, most IRA suspects operating in the province were known to the authorities and their movements could be controlled, in the 1990s Balkans conflict, problems emerged due to the area of operations being larger and not as well known to NATO forces, which impeded situational awareness. Problems with situational awareness are likely to be even more acute in the future as acknowledged by the UK MoD in its 2010 Joint Doctrine Note 2/1 The UK Approach to Unmanned Aircraft Systems. It lists a scenario where the UK is part of a multinational coalition established to counter terrorism and organised crime in a mega-city of 38 million people spanning 1800 m2. Assets described include 100 micro-UAVs positioned across the city, airborne or temporarily landed on buildings. Lincoln-Jones terms this “perch and stare,” a trait accomplished by the Huginn UAV currently produced in Denmark by Sky-Watch. The Huginn is mainly used for civilian applications, but it is adaptable to military uses. Made from commercial components such as mobile phone batteries to provide endurance of between 60 to 90 minutes, the Huginn UAV can be flown to a location and then manually piloted if necessary. It is produced using 3D printing, which is a significant prospect for nano-UAV production. Dunn says 3D printing would allow for UAVs to be printed for specific tasks, for example, a swarm of nano-UAVs, which could help overcome the short range and battery life inherent in current types. Swarms of nano-UAVs could track terrorist targets by embedding themselves within buildings undetected. A networked system of nano-UAVs means a larger area can be covered. They can also infiltrate heavily defended areas. According to UK media reports, nano-UAVs were used by British Special Forces to confirm the location in Raqqa of the militant known as “Jihadi John” prior to his death in a missile strike on November 2015. However, Storr makes the point that the application of nano, and other types of UAV, must always be considered on a case-by-case basis based on a cost/benefit analysis. Dunn cites the example of a fast-moving hostage situation where a nano-UAV could assist by being flown close to a building where the crisis is unfolding to enhance situational awareness. Another nano-UAV could be deployed behind the same building to further broaden the picture. 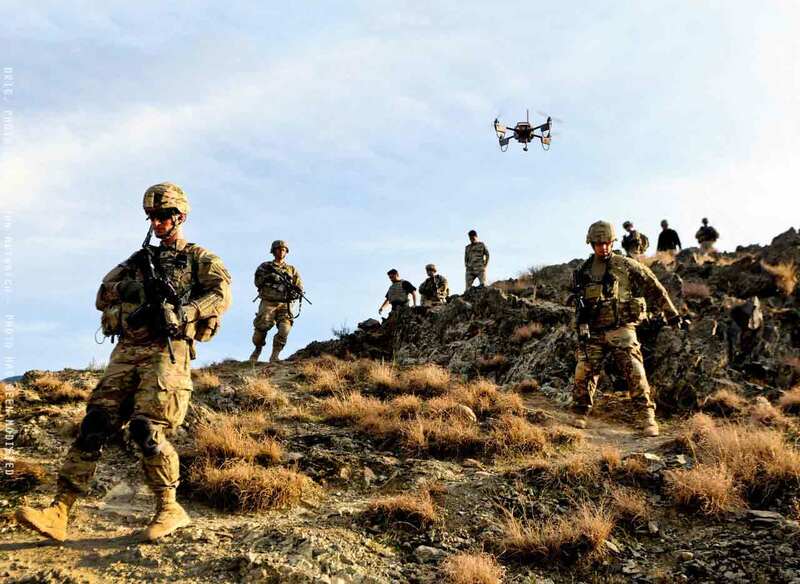 Although he stresses this capability should be complementary to, and not replace existing counter-terrorism measures such as manned helicopters for a broader view of the unfolding situation, in this type of operational scenario nano-UAVs clearly have a strong advantage. However, he points out an inherent disadvantage of nano-UAVs due to their size; they are badly affected by adverse weather conditions such as strong winds. Lincoln-Jones states that the Huginn was considered for counter-IED operations in Afghanistan, but the older and less user-friendly Desert Hawk was chosen due to procurement constraints and its larger size, which was better suited to the environment. Storr argues that with all new military innovations, the enemy will find a way to counter the device. An historical example of this is the two sides of the Western Front, which seeing the results of one another’s aerial reconnaissance, developed fighter tactics that spawned fighter-on-fighter combat. This was possible because both sides knew about the other’s aircraft. The point is, limited awareness of nano-UAVs has meant little thought has been given to their potential vulnerabilities. Storr points out that in a confined space, a nano-UAV could be easily identified by hostiles. In such an environment, it would be easy to remove using 'dumb' technology like household chemicals, which would corrode the UAVs' electronics, rendering it useless. However, if the UAV were made larger to compensate for these vulnerabilities, its covertness would be compromised. Storr describes a vicious circle of “weight, size and payload,” with one being increased/decreased at the expense of the other factors. Lincoln-Jones says nano-UAVs are currently inappropriate for “loitering offensive” operations given endurance, payload and environmental issues. Therefore, counter-terrorist forces must consider more traditional means for enhancing situational awareness. This could entail drilling a hole in a wall and feeding a sensor through it, which occurred in the 1980 Iranian Embassy siege, to observe the acoustics of the situation. Applications for nano-UAVs can be sourced from the natural world, which has inspired nano-UAV designers; as the name Black Hornet suggests. Dunn suggests an option where living insects are implanted with control software and cameras to provide many of the capabilities described above, but this raises many ethical and legal issues. As reported in the Daily Telegraph in March 2016, scientists recently placed an electrode on the back of a beetle, which meant it could be controlled by a human operator. The varied applications of nano-UAVs demonstrate the potential of this new technology, but the fact is that technical and doctrinal issues remain to be overcome, while traditional methods of intelligence, surveillance and reconnaissance cannot be discounted as each situation will require different approaches. After achieving a BA Hons. in International Relations with Political Science, Jack Richardson is studying part-time for an MA in Air Power: History, Theory and Practice at the University of Birmingham. His initerests include geopolitics and military history.